Flagstone has recreated a number of ancient column designs that may be combined with various Caps, Bases and Plinths to create beautiful architectural effects that enhance modern homes. 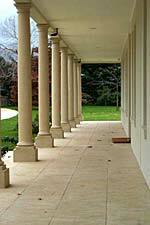 Flagstone columns are constructed from a special blend of cement, minerals and selected sands. This ensures not only a smooth finish that weathers and ages just like the hand-worked natural stone columns of history, but strength and durability as well. All columns are constructed in compliance with applicable standards, and our standard "non load-bearing" Columns are manufactured with 50mm od 4.0mm walled steel pipe to ensure the load bearing potential required for the typical pergola or collonade. Specified "Load-bearing" Columns can be considered to clad the engineer specified and nominated thick walled steel tube/pipe core, which carries the whole of the load to be supported, whilst providing the fine texture and aesthetic finish of a classic column to your project. Plinths are also available to provide variation in height. 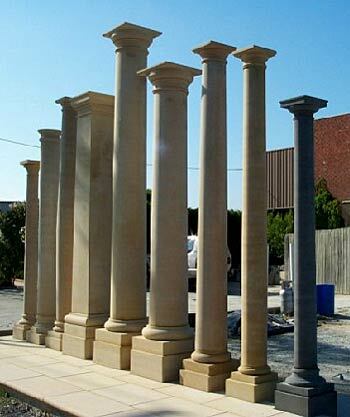 Sizes can be varied to suit your height requirements and, like columns they can be obtained across the range of Flagstone colours.